How was the term and Bridesmaids created? They say that from religion and periods, bridesmaids were the backbone of the bride by staying together when the bride would travel to the groom village. The law required ten witnesses in order to beat and outsmart spirits. The bridesmaids and ushers dressed the same as the bride and groom so that the spirits would not know who was getting married. Wow how times have changed since then, now bridesmaids are what makes the bride so special, the love and years they shared and growing up together, how they have that solid bond of unity. 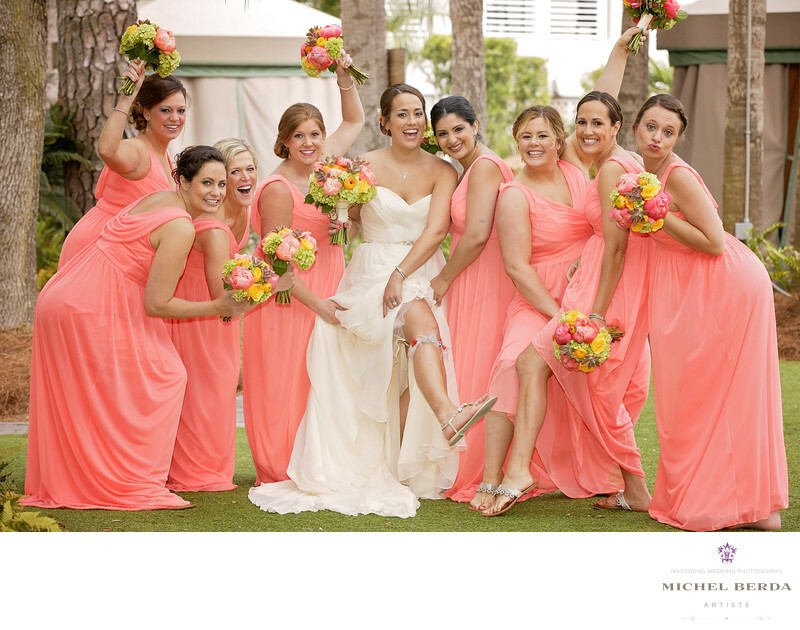 Many times bridesmaids include their sister sibling and then many other very close best friends. I love when a client goes on line and searches wedding photos Westin Resort Spa Hilton Head, I have so many various images that I have captured at The Westin Resort & Spa in Hilton Head, South Carolina. Take a look at this image of pure joy and love for the brides 8 bridesmaids all simply dolls and having fun in our photo session. I asked the ladies to do their own posing for this last image and I could not be any happier then how full of great emotion of joy and posing, and colors this image turned out. This will be one of the best bridesmaids wedding photos Westin Resort Spa Hilton Head.